I spent a week in Quebec City. Since this was Canada, I had to indulge in one of the foods that Canada is known for that rivals maple syrup and Kraft macaroni. I sampled far too much poutine during my week in Quebec. I was apprehensive at first. The combination of French fries smothered in gravy and cheese curds didn't exactly sound super appetizing. Once I started tasting the various poutines around the city, I suddenly saw while almost all but one restaurant I visited didn't have poutine on the menu. It's because the dish is delicious! My first poutine tasting happened at a 24 hour restaurant in Quebec City's Limoilou neighborhood. They were called Casse-Croute Pierrot and specialized in poutine, pizza, sandwiches, and other foods. It was basically a 24 hour diner, but I kept on hearing it referred to as "The Poutine Place" during the duration of the nearby event that I was in the city for. I decided to try the Poutine Special Pierrot. It was topped with pepperoni, mushrooms, green bell peppers, and onions in addition to the mandatory gravy and cheese curds. I had ordered the smaller 7" plate of poutine, and it ended up being a humongous mound of deliciousness. I couldn't see a single person eating a 9" plate from this restaurant. The pepperoni on here was interesting. I'm wondering if pepperoni in French actually translates to another type of sausage. This pepperoni was less spicy, was more pick than red, and seemed to resemble a type of salami as opposed to the typical pepperoni that Americans are used to. If I knew that champignons translated to mushrooms, I might have requested that they hold them, but my lack of French made me eat foods hat were slightly out of my comfort zone and it was delicious! Another poutine experience happened at Pub du Parvis in Downtown Quebec. I tried their Octoberfest Poutine. Not being able to fully translate the menu, I was able to figure out this poutine's toppings included caramelized onions, beer somewhere in the dish (gravy maybe? ), and the meat of the day. Our waitress didn't know the English word for the meat and the French word meant nothing to me. Regardless, I ordered this anyway wondering what the mystery meat might be. It turned out to be some sort of blood sausage and was delicious. I was told by someone visiting from Wisconsin that you can tell a good quality cheese curd based on whether or not it squeaks when you bite into it. The curds on this poutine did indeed squeak (Casse-Croute Pierrot's did not). I'd vote the poutine from Pub du Parvis my favorite poutine that I tried in the city. Now this isn't poutine, but I did end up at Pub du Parvis a second time during my stay (was a block away from my hotel) and tried one of their pizzas. Since where on the subject of Pub du Parvis, I'm going to sneak their Greckoroman Pizza into this post about poutine. The pizza had a really thin, almost cracker-like crust. The only problem with this crust was that the pizza was a little hard to cut up (didn't come sliced). It was topped with feta, onions, kalamata olives, tomato, arugula, and yogurt. I've never seen yogurt on a pizza before, but it combined nicely with the feta. I preferred the poutine to the pizza, but Pub du Parvis still served a perfectly respectable pizza. I was attending an event in Quebec City and they bought everyone poutine from Pizzeria Stratos one afternoon. Pizzeria Stratos claims to be Le Roi de la Poutine, or the King of Poutine. Turned out that the Le Roi was my least favorite poutine from my trip. This poutine was essentially cheese fries with gravy. That said, the gravy was really tasty. It had a very nice peppery flavor, but everything else would have not made me see the appeal of poutine if this was my first experience with the food. I don't know if the cheese curds had melted while being delivered, but Stratos' poutine looked more like a heart attack in an aluminum tin as opposed to something gourmet and delicious. My last real poutine experience in Quebec was at a fast food restaurant called Chez AshTon. This was a chain (I saw another in the nearby town of Levis). From reading the menu, this looked like a French Canadian version of an Arbys, only better. They seemed to specialize in roast beef sandwiches and burgers, but of course had a selection of poutine to choose from. Quality wise, Chez AshTon seemed slightly better than American fast food chains with signs advertising the use of local beef from Quebec free from antibiotics and hormones. I was going to just try one of the poutines here, but then I saw the sign for Assiette Rosbif Ave Poutine. A roast beef sandwich with poutine seemed to be getting the best of both at Chez AshTon. I didn't have high expectations from a fast food chain, but I enjoyed this meal. The roast beef sandwich, fries, and cheese curds were placed on a plate alongside lettuce, tomato, and peas. Everything on the plate was then smothered in a pool of gravy. The poutine itself didn't have fancy toppings, but the cheese curds did squeak. The roast beef definitely seemed better than it's Arby's equivalent. It seemed more like meat rather than something highly processed. The gravy made it better, with the tasty sauce soaking into the bun. The bun was the weak spot of the meal. Almost all the bread I had in Quebec City was amazing, but this was a standard hamburger bun. The peas were unexpected but were a nice touch (again, made even better soaked in gravy). I'm glad I was pleased with fast food poutine! I had never heard of Casa Bonita in Denver. Before going, I was discussing my upcoming trip with someone who had just returned from Colorado. I was told that Casa Bonita is a horrible restaurant that I must visit. Horrible and must visit aren't two phrases that often go together with restaurants, so I made up my mind that I must go! Located in the corner of a strip mall, you enter and order your food at a counter. It is handed to you almost immediately, which I'm assuming means everything is pretty much pre-made. You are then brought to your table. This leads you into an open area overlooking cliffs, waterfalls filling a pool down below, a town, and more. I see some definite inspiration for Epcot's Mexico Pavilion in Casa Bonita. Chips and salsa were included in the meal, like most Mexican restaurants. I had the Chile Rellenos Platter for my main course. I was honestly expecting crazy priced bad food, but the prices here were equivalent to other Mexican restaurants and the food was tasty enough. The platter came with two chile rellenos, rice, refried beans, guacamole, and sour cream. The serving size was very large and definitely filled me up. Two Sapodillas were served for dessert with a bottle of honey for a topping. I was stuffed at this point, but I ate them along with my other food very slowly to stall. Stalling is important here because those cliffs and waterfalls in the center of Casa Bonita aren't just pretty decorations. Corny shows happen every fifteen minutes on the cliffs. While I was eating, there was fire juggling, a cowboy gunfight, and a show with a guy in a gorilla suit. Every one of these bits ended in somebody diving off a cliff into the pool below. It was all extremely corny, but much more enjoyable to watch than some other themed restaurants like this that I've visited (like the Jeckyll and Hyde Club). After I was done eating, I wandered around the restaurant for a while. I ventured into El Mercado, which was Casa Bonita's gift shop. I also ventured into Black Bart's Cave. This dark, winding cave took me past pirates, paper mache monsters, buried treasure, and all sorts of cool stuff. It reminded me of something from Orlando's old Mystery Fun House. I am totally glad I listened to the advise to visit Casa Bonita. This was probably the best Mexican restaurant I've visited that was described to me as horrible! I was told to check out the town of Brekenridge while in Colorado. It turned out to be one of my least favorite places I visited on my trip, but that may have been because of the time of year. Most of the town was shut down between the winter ski season and the summer season. From the signs in the windows of many of the stores, I was about a week early before the town started reopening. While there, I had dinner in one of the few restaurants that were open. This was a food truck called Crepes a la Cart. I ordered the Crepe Atlantic. This was filled with smoked salmon, spinach, red onions, and hollandaise sauce. The fillings were put into a crepe folded in a triangle shape. The whole thing was then slid into a paper wrapper. The wrapper had a perforated line which allowed the paper to be peeled away neatly as the crepe was being eaten. The crepe was very tasty. The lox-like smoked salmon was plentiful. There was lots of spinach, and the hollandaise kept everything moist. The crepe itself was very thin and served as a good vehicle to get the fillings up into my mouth. While I wasn't impressed with the town of Breckenridge, at least I was impressed with the crepe that I ate while there! Horror movies are fun. Historic hotels are fun. Combine the two, and I found myself stopping at The Stanley Hotel in Estes Park, Colorado. In horror movie terms, this was Overlook Hotel from The Shining. The Stanley Hotel seemed to get into their horror movie identity as the Overlook more than I expected. They were having a horror film festival on the day I was there. There were exhibits set up explaining the history of the hotel with The Shining. It made me happy that they embraced their horror movie history as much as they did. While there, I stopped into their coffee shop called Steamer's Cafe. I was pushing through three feet of snow up the side of a mountain to reach a huge waterfall. It was 70 degrees out and I wasn't wearing a jacket. My Floridian brain couldn't quite comprehend what was going on. Huge mountains and snow existing in temperatures that didn't require jackets was something that didn't quite register for me. I guess that's how early summer in Rocky Mountain National Park works. After my hike through the snow, I was hungry. I made it back to my car and drove out of Rocky Mountain National Park into Estes Park. I decided to have lunch at a restaurant called Nepal's for some Nepalese and Indian food. Since my Florida brain couldn't comprehend how snow covered mountains work in the first place, I could easily pretend I was in Nepal near the base of Mount Everest. I decided to order their lunch buffet. I'm not exactly sure what foods were more based in Nepal or what was more Indian. I'm assuming their foods are pretty similar based on what was on the buffet here. There was lots of kormas, dals, curries, and other foods which I was familiar with from Indian restaurants. There were a few outliers on the buffet though, such as the lo mein. Here's a picture of my first plate of food, along with a cup of chai tea. Somehow I ended up trying too much pizza while I was in Colorado. I wasn't planning on having so much pizza, but the opportunities seemed to arise. What I did find out, from my limited sample size, is that the Denver area of Colorado has some very respectable pizza. I can't say this about other cities that I've had multiple pizza data points with (ie- Atlanta). My first pizza experience was in the town of Golden at a restaurant called Anthony's Pizza & Pasta. Golden is a suburb of Denver which seems like they want to be historic while the majority of the buildings in downtown looked very new. Anthony's was located in one of these very new looking buildings. I ordered a slice of cheese. It was a large slice with nice thin crust. It was pretty tasty. Not the best slice ever, but it was still good. Pizza Alley was in Dever's Highland Park neighborhood. I stumbled upon this place as I was looking for dinner while finding out that restaurants in Colorado close very early. I was later told this is because of Colorado's outdated liquor laws that only allow alcohol to be served to 11 pm. Not sure why this causes a whole lot of restaurants to close at 8:30 pm or how accurate this was. Pizza Alley closed at 9 and they said I had plenty of time to eat there if I was only getting slices when I arrived at 8:45. 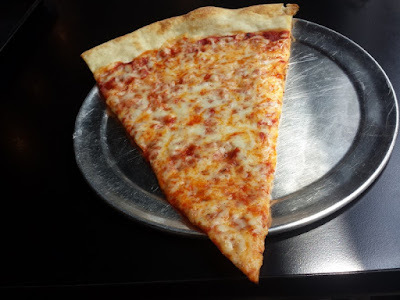 My slice of cheese and white pizza weren't served until 9:10, and I was pretty much shoed out the door as soon as they were delivered to my table. I have a feeling someone forgot to put them in the oven. The pizza was good. Like Anthony's, this was thin NY style pizza. The slices were big enough to hang over the edges of paper plates. Both were good, but I preferred the very garlic heavy white pizza. My third pizza experience in Colorado was at Beau Jo's in Idaho Springs. Unlike Golden, Idaho Springs seemed like all the buildings were actually old and historic. I wasn't planning on pizza for a third time in a four day trip, but when I noticed their sign was touting Colorado Style Pizza, I decided I must give it a try. I had never heard of Colorado having their own regional style of pizza, so I was curious. On the menu, Beau Jo's gave options for what fell into the category of Colorado style pizza. They gave the option of Mountain Pies or Prairie Pies. They were sold by weight, ranging from 1 pound to 5 pound pies. According to my waiter, the Mountain Pies were the more unique pizzas, while the Prairie Pies were pretty much a typical pizza. I picked one of their Moutain Pies called the Yukon. It was topped with sauce, Canadian bacon, artichoke hearts, roma tomatoes, mozzarella, and provolone. The pie had an interesting twisted crust. It was definitely similar to a deep dish pizza with the crust holding the mass of toppings in. Unlike a Chicago style deep dish pizza, I don't think this was cooked in a pan. This Yukon pizza was the most interesting pizza I had in Colorado, but it was also my least favorite. The sauce reminded me of Lunchables pizza sauce. I'm not exactly sure how I remember how this sauce taste since I don't ever remember eating many of these. I wasn't a big fan. The tomatoes and artichoke hearts were soggy which made all of the juices pool over the slices of Canadian bacon. This meant a wave of liquid rolled off of the meat every time I picked up a slice, bringing the cheese with it. My first experience with a Colorado Style pizza didn't impress me, but at least I can say I've tried this type of pizza!